WordPress is the most popular content management system in the world, powering over 32% of all websites on the Internet. With the right template and plugins, you can turn WordPress into almost any type of websites. WordPress is a great choice for your content management and it provides the cheapest and fastest solution to build your website online. These days, it is no longer a pain when come to installing and setting up a WordPress site to your host. Most of the web hosting providers offer an auto-installer to make the process easy. So, the next time when you are looking for a web host, make sure that they support automatic WordPress installation. In this article, we’ll show you how you can install WordPress in Plesk by using its WordPress Toolkit. Plesk is one of the most widely used web hosting control panels designed to simplify the administration and management of websites. Most of the web hosting providers do provide Plesk as a choice of control panel in their hosting plans. WordPress Toolkit is an extension for Plesk which allows you to automatically install, configure, and manage WordPress instances under one dashboard. You can manage WordPress files, plugins, themes, database, updates, security, backup, and others with less effort and minimum technical knowledge. Do note that WordPress Toolkit is only available as free for the Web Pro and the Web Host Plesk editions. If you’re using the Web Admin Edition, there will be a fee for using this extension. 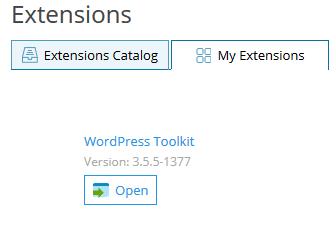 WordPress Toolkit extension is installed and enabled by default in Plesk. You can verify this by clicking on the Extensions link in Plesk and select My Extensions. The WordPress Toolkit extension will be listed here if it is already installed on your web server. In case if this extension is not installed by default, you can install it manually by typing WordPress Toolkit on the search bar, select WordPress Toolkit from the selection and click on the Install button to install this extension. Now, go to the domain name of which you would like to install WordPress on and click on the Install WordPress button. 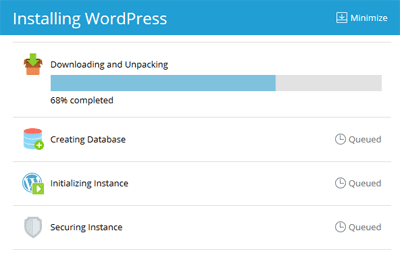 The WordPress installation screen will then appear and you’ll need to provide some details for the installation. Site Language: The language of your website. Version: The WordPress version that you would like to install. You may use the latest version or an earlier version. Username: The administrator username. For security reason, we do not encourage to use admin as the administrator username. Password: The administrator password with at least 8 characters in length. Email: The administrator email address. Database Name: You may use the suggested database name or enter your own preferred database name. Table Prefix: You may skip this field to use the suggested table prefix. Database Username: The database username. Please note that this is different from the administrator username. Database Password: The database password and is different from the administrator password. This field will also require at least 8 characters in length. WordPress - I suggest leaving this option to the default selection which is Yes, but only minor (security) updates. Plugins: Toggle to turn on this option if you prefer to auto update your WordPress plugins. Themes: Toggle to turn on this option if you prefer to auto update your WordPress themes. Click on the Install button to start the WordPress installation. The completion screen will appear upon completion of the installation. That’s it. We’ve successfully installed WordPress in Plesk and you can now start configuring the WordPress site.